Oswald's Trail is a 12.6 mile (21km) walking route around Oswestry using existing footpaths which have been improved and, in some cases, opened up after years of being unused. The booklet describing the route can be downloaded here. The booklet is also available free from various places such as Tourist Information Centres, Oswestry Library and Booka. Starting at the bus station the route goes along the east side of the town and then heads out into open countryside, taking in Llanforda, the Old Racecourse, Brogyntyn Park, and Oswestry Old Hill Fort. The route passes many of the sites of interest around Oswestry and links in with the recently opened Oswestry Loop of the Shropshire Way, the Offa’s Dyke path and the Wat’s Dyke path. There is now a shortcut available from Wilfred Owen Green, then beside the railway to Salop Road. 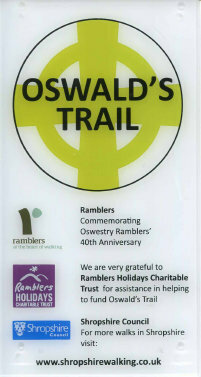 The project to create Oswald's Trail was funded by the Oswestry Ramblers Group with profits from two published books of local walks, a grant from Ramblers Holidays Charitable Trust and a small grant from Shropshire Council. Shropshire Council has project managed the improvement work to the route.